I'm Late Posting because our service provider has been out and just came back on. FOR PUTTING TOGETHER ANOTHER FUN FRIGHTENING HOP. YUCK, LOOK AT THAT UGLY CORD...I'M JUST NOT A VERY GOOD PHOTOGRAPHER...THAT WOULD BE MY PROFESSIONAL PHOTOGRAPHER DAUGHTER'S GENE POOL. PLEASE VISIT THESE GIFTED LADIES. THEIR CANDLE SHINES SO MUCH BRIGHTER THAN MINE BUT I LOVE BEING AMONG ALL THIS TALENT. Oh sweetie, your photos are better than mine. I love your mini, but really love that pillow. I have several body pillows all over - should really think of those next time for some fun decor. I love your projects. Those are some sweet pumpkins! I love the kitties moon gazing! And I kind off love seeing other people struggle with picture taking..... I can totally relate! And to be truthful, that picture of James and RJ is gorgeous. Thank you for sharing. Great projects, love the cats! your pillow is so cute. Thanks for sharing your creativity. 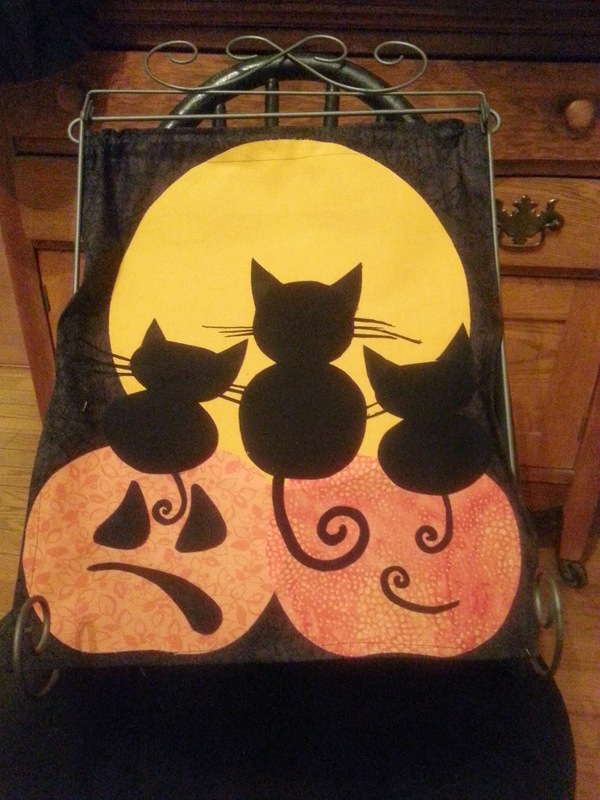 lovely projects and i love the cat so much..
You've made some really neat Halloween projects. I had to laugh about your cord comment...the cord I would not have seen if you had not mentioned it ~lol~ I am always editing pics to cut out a spot on the rug that only shows up in pics, or a cup on the end table, etc. Your candle is burning brightly! Love the little mini cat quilt and the fluffy pillow. Wonderful job! What cute kitties Jane. I love them sitting there looking at the moon! Your pillow and owl are adorable too. Great job. It looks like your kittens are singing. Fun halloween decor and sweet boys. Wonderful projects! I really love the pillow. I always love your mini quilts! Those 3 kittys made me smile.. and so did those grandbabies. Too precious. wonderful projects!!! I love the cats!!!! Lovely projects! Those pumpkin expressions are just wonderful, but that last little pumpkin is the sweetest!!!! What a blessing it is. What cute projects, and what ADORABLE grandchildren! aww.. is right, pillow and babies. Beautiful pictures,Gmama Jane, especially of James and his new brother. I love the mini quilt with the cute little black kitties. 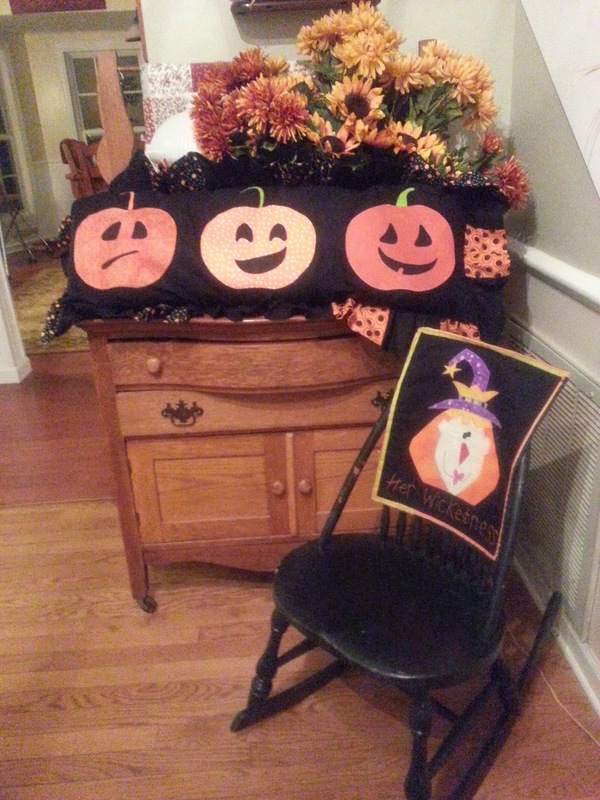 And the pillow with the pumpkins is adorable.Love the faces. Thank you for sharing today. You did a wonderful job! You did a wonderful job on all your projects. Love the pumpkin pillow. Your new baby pumpkin is adorable. Love the expressions on those pumpkins and the shape of the kitties. Great projects. I didn't see the cord I was too busy admiring your work! James and RJ look comfy together, real brotherly love. Oh Gmama Jane I just love, love, love those kitties...they make my heart sing. Beautiful pillow too! Beautiful grandbabies! Thanks for sharing! Oh...and your light gently bathes all those around you! Very cute projects. Happy Halloween! 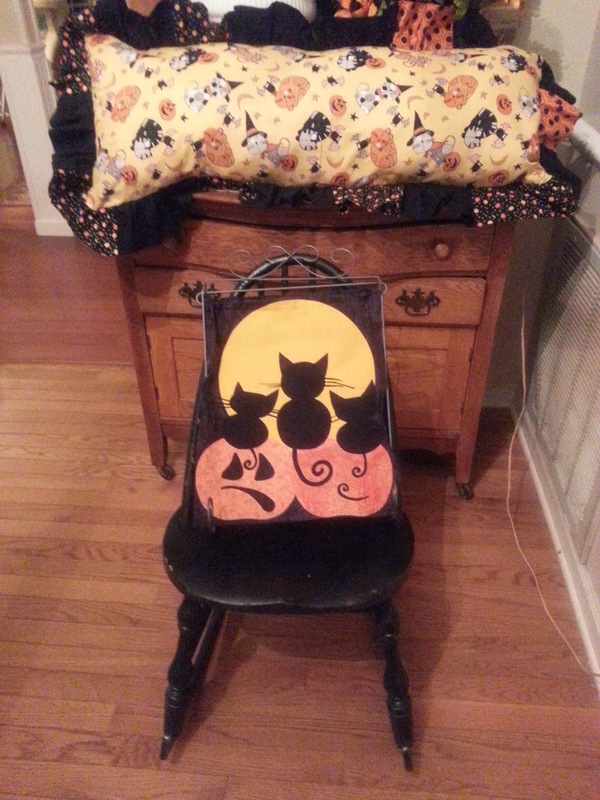 You mini quilt is so precious, Jane, Great idea to turn the cats around so the tails show against the pumpkins. A haunting Halloween scene for sure. The pillow makes this a Halloween decorating dream. Congrats on the new grandbaby!!! Hi!!!! Beautiful grand children!!!! I love your little kittties!!!!! Adorable!!!! Love that their tails make the pumpkin faces!!!!! Love your ruffled pillow too!!!!! Your little kitties on the pumpkins is adorable. Thanks for sharing. Very cute pillow and hanging. I often notice things like the cord when I am looking at my photos afterwards. I don't seem to notice them when I am taking the picture though. Great job today! I love those kitties on the funny faced pumpkins! Looks like you have two beautiful grandsons! Congrats on your new grandson. I like your mini quilt with kitties looking at the moon. The pumpkins faces are funny. Great job on the pillow. I like ruffles too, only done them once though ha ha. Your owl is a hoot and I love Wicked Wanda. really pop out against the . I have to say, though, those grandsons are not the least scary. Cuties. Awwhhhh!!!! SO STINKIN CUTE!!!! Love the faces on the Pumpkins! Oh and that perched little kitty! PERFECTION! Your witchie is just icing on the cake! Oh...and such a sweet photo of the boys...wow...amazing. I don't think I could say it any better than Lana...Stinkin Cute just screams at me! 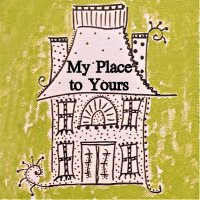 What fun all your little haunting treasures are!! All of your projects are perfect for the season! I know those two adorable boys will enjoy seeing them in your home for many years! Great job! Love those Pumpkin Faces!! Jane everything is so darn cute even the New precious Baby!! Blessings my friend! and thanks for sharing your Halloween creativity!! Your projects are all so cute, love the kittens watching the moon and the happy pumpkins on the pillow. Hootie is so fun he just puts a smile on my face but nothing can compare to those two grandkids. They are adorable. Great projects but the grands stole the show! Love how the kitties tails made the pumpkin faces, Thank you for sharing. Wonderful projects! I especially love the mini quilt. Those cats are just too cute. Congrats on the new grandson. Your cats are adorable!!! They remind me of my three, in silhouette, gazing at the moon!! Your pillow is so cute - great pumpkin faces - and that ruffle is the cat's meow!!! Thanks for persevering and getting your post up as soon as you got internet restored (I live in the country and totally get that problem!). How fun and cute are all of your Halloween projects! Your mini black cat trio with the pumpkins are adorable! I like the pumpkin fabrics. And congratulations on the addition of a new grandson into your family! They are precious. I love all your projects, especially the kitties and pumpkins wall hanging. Thanks for sharing! Wonderful mini and that pillow is priceless, great ruffle. Now that last photo of all the adorable wickedness. I just love that he dressed up like a big brother for Halloween. They are soo cute, (boh the projects and your grandsons) I like hor you put ruffles on the pillow...it sure adds to it. Very cute! Your wall hanging is so adorable and the expressions on the pumpkin faces are so cute!! Love all your projects! And the little extra of the grands. Wonderful mini quilt and pillow! Your grandsons are adorable. It's all super cute. Especially those boys! Congrats to the family! I love the mini quilt, just look at those kitty bums! And I like how you made the ruffle "patched" like the pumpkin patch it surrounds. So clever! Thank you for sharing! Very cute projects! I love those 3 black kitty cats, just looking at the moon. Congratulations on the new addition to your family !! You created come cute little kitty's ! Darling pumpkins! I love their expressions and the cats' tails. Darling grandkids too!!! sweet projects all of them. My daughter would love the owl pin cushion. Love the pumpkin on the left's face (first picture) I don't think he likes having a kitty bum in his face. 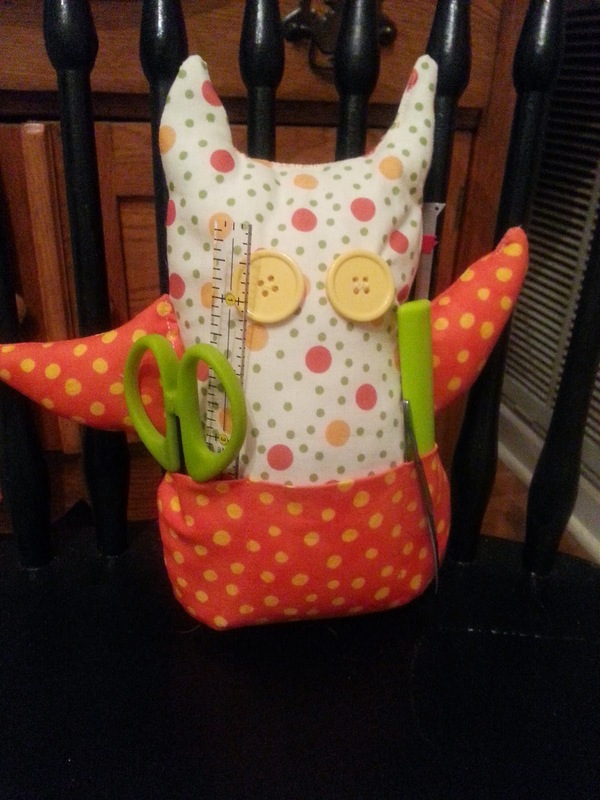 LOL Really cute projects, love the big smooshy pillow and the cute little owl. But of course, nothing is as cute as those grandsons.<3 Thanks for sharing. 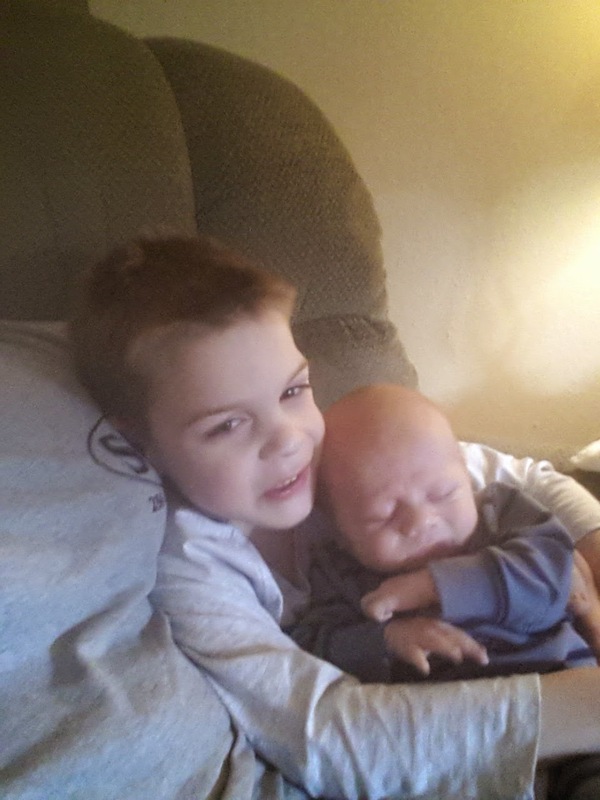 The new grandson is so cute, but so is his big brother. Great projects and your pumpkins are so cute! Lovely projects, especially the mini-quilt. And adore the picture of James and the new baby...how wonderful for you all! Fun designs! And thank you sharing the picture of your new grandson. Cute kitties with curly tails! Great projects! Congrats on the new grand baby, cute picture of him with his brother. Love the cats with the curly tails. Thanks for sharing. Cute pillow. I love the wall hanging; I can just imagine being that poor little pumpkin gettin' squished from the kitty sitting on him! Great moon, BTW. Your candle certainly shines with those cat silhouettes on the pumpkins. Very cute projects. 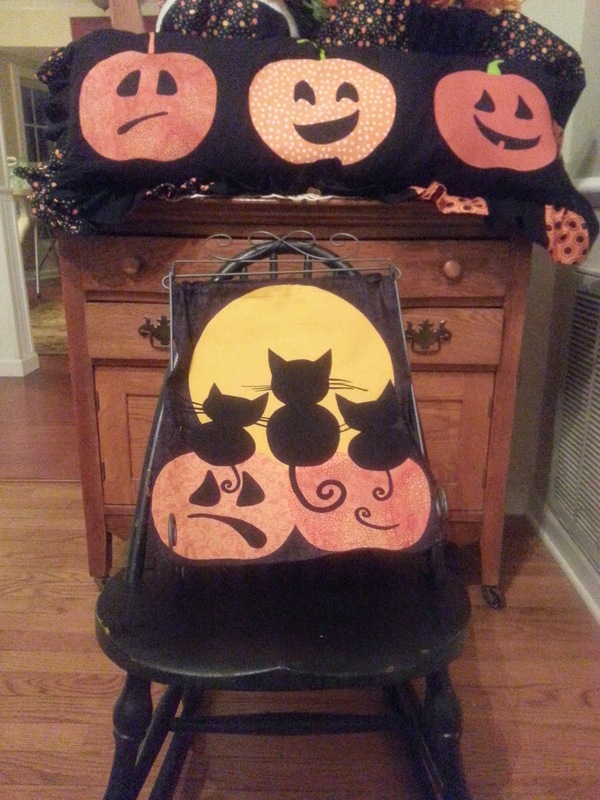 Love that pillow with the pumpkins and ruffles and those kitty tails are adorable! But not as adorable as the two cute creations at the bottom. Such sweetness. The pumpkin on the far left is the best! The sad face melting face off gives the project some humor.... great work! I am lovin those sweet little black kitties. The pumpkin pillow is spooktacular as well! No tricks here, tons of treats! Love your projects especially the row of pumpkins! I can see your e kittens mewing at the moon. Great show. I love your black cat mini with those cool tails hanging down. :) And what a sweet, sweet picture of the boys. Just love your minis! Great pillow too...you had some fun, I can tell! Hi Jane Love all of your projects they are so cute. I was so happy to see a picture of James and RJ,they are both so sweet. Just in case you are not looking at your e-mail I sent you one on Monday. Your pumpkins are delightful but the picture of those sweet brothers definitely steals the show! The mini quilt is just too cute. Love the faces of the jack-o-lanterns. Your projects are all great. Really cute mini quilt, love it! Adorable! I feel your pain about photography. I would love to find a class or something to help me take better pictures. Thanks for sharing your creations with us! How fun! I love your mini quilt and the pillow is fantastic! So, so cute and thanks for the pic of the brothers. That just warms my heart. Beautiful work.....those kitties are so cute! Your little grandsons are adorable too! Oh my goodness but I adore your kitty quilt ... granted all of your work is wickedly good, but I'll be darned but I would love to have the kitty and pumpkin quilt on my wall! Thank you so much for participating and great job! Your kitty quilt is so cute and I really like the pumpkin faces on your pillow. What beautiful grandsons! Thanks for sharing. I especially love the cat mini quilt. Congratulations to you all on the new baby - I know the adoption process can be quite stressful. Lots of cuteness Jane...love the mini with the hind end of the cats sitting on the pumpkins!! Looks like the pumpkin is getting squished...fun, fun, fun!!! James and RJ are adorable!! 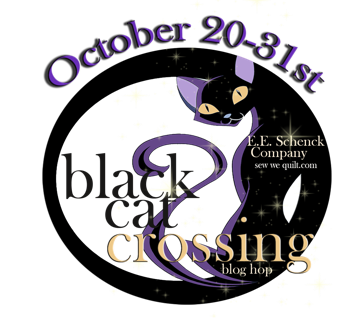 Thanks for sharing in the blog hop!! Oh, my goodness, how cute are all your projects and those sweet boys!! Gives me goosebumps!